Within a few weeks of the baby’s arrival, Mother and Grandmother decided to go back to the Farm. I didn’t want to go, because I couldn’t stand to be around Mother’s husband. Buck was such a whiner and sniveler that within ten minutes of being in his presence, I felt near mindless rage at his abyssal ignorance and hubris. He repeated stories of uneducated rubes who managed to “pull a fast one” on anybody with brains or education, where dumb luck and foxy cunning came out on top. He was intimidated by intellect, most especially in a woman, so these stories were always directed at me. It completely baffled me that Mother couldn’t see through him. 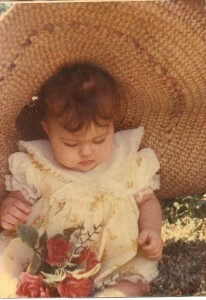 My baby at the farm with plastic roses and a big hat! After two months of rest, I knew I’d have to go back to work. Mother most definitely was not going to let go of Grandma (and her bank account) even if she wanted to be with me and the baby. I knew that Grandma wasn’t well enough to help with a baby yet, and it was better if she wasn’t tempted to put too much strain on herself. Yet, she wanted to be with the baby, and I knew she didn’t have many years. So I needed to move back to the Farm too. There was no way I’d leave my baby in the care of strangers, and Mother was most willing to take care of her while I worked. On Mother’s own terms, of course. But, beggars can’t be choosers. I closed up the house in Tampa, found some friends willing to move my piano, and back to the Farm I went. Even though I had some experience and two years of college, the job choices were limited. I ended up taking a position with the State Department of Health and Rehabilitative Services as an interviewer and certifier in the local Welfare office. The Farm was in rural Pasco county, and the State Offices only employed about a hundred people on the West side with all the departments in one place: Social Services, Child Welfare Protective Services, Food Stamps, Aid to Families with Dependent Children, and a few other odds and ends. West Pasco County had half a dozen small communities along the main coastal highway 19, and they all blended together with a few traffic lights separating them. My own unit consisted of about a dozen people, six of whom were certifiers, and we all shared a couple of clerical workers to handle the phones and filing. Our boss, John Dear, was a retired military base commander with a gruff way about him, very big on “morale” and “chain of command,” but also very fair minded. All of us adored him. My co-worker Nancy was married to the mayor of one of the little coastal towns. She was petite and funny and always brought a big bowl of sugar free chocolate pudding with a two inch layer of whipped topping for lunch. She was counting carbs, and it really worked for her! Sabrina was divorced from a wealthy doctor who was slow to pay her alimony, but she still dressed to the nines. She was gorgeous, too, decked out in the latest fashions in a backwater welfare office, sitting across the desk from the often dirty and poorly dressed clients who came for assistance. She had a good heart, though. Tim was a retired New York City policeman working on a second pension, and after all his experiences, nothing fazed him. He was out the door at break time, lunch time, and time to go home no matter what else was going on. He could forget it and walk away! He never did one thing more than was required by the job description. Jody was the wife of a raging drunk she described as an alcoholic. She attended Al-Anon meetings regularly and the philosophy she exuded was pretty much “what, me worry?” She didn’t, but she drove everyone else nuts. She could criticize with the best of them, but she never did anything wrong herself! Finally, there was Sandra, a big, beautiful Sicilian princess from New York. Sandra believed anything could be cured by a plate of pasta and a heart-to-heart talk. She organized monthly “secret pal” days, set up pot-luck dinners in the lunch room, brought decorations for every holiday and supervised their arrangement. Nothing made her happier than getting everybody together like a big family to cook, eat, laugh and fulfill some ideal she had of love and kindness and good manners. You can probably figure out that her home life lacked all of these things. Both the clerical workers were retirees who decided to take jobs to keep from falling into a decline. Of course, this meant that wherever they worked, the decline went with them! Ellen was the bane of our existence. She had worked many years for a firm of attorneys in Boston before retiring to Florida. Ellen couldn’t remember anything for two minutes, where she put a phone message or left a file folder, but we were expected to make due obeisance because she was a “real” secretary. She resented ordinary clerical functions and expressed her disdain by being so incompetent that we would all think twice before asking her to do anything again! I really tried to be patient and understanding with Ellen because of her age and related failings, but it was hard. My patience came to an end one day after I caught her falsifying a document to cover up the fact that she had screwed up a case, causing extreme hardship for an entire family who went without food and shelter for almost a month as a result, while she kept lying to cover up the fact that she couldn’t remember where she had put the documents that were supposed to be in their file. As much as I had sympathy for her, I railed against the fact that allowances were made for her incompetence at the expense of others. Ellen’s daily screw-ups were a regular topic of discussion. Unfortunately, the union and the tenure system for state employees, making us feel secure in our jobs, also kept incompetents like Ellen in theirs. None of us wanted to see Ellen lose her pension. We just wanted the State to find a place for her where she could really “fit”. Finding ways to get Ellen to apply for a transfer to another unit became a primary occupation. 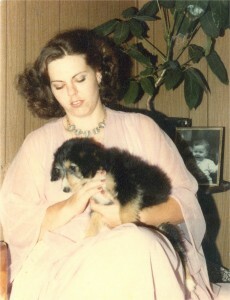 I had some mink heads and tails made into clasps for sewing projects and one day I brought them in to show to Sandra. We looked at each other, looked at the little desiccated head with glass eyes and gleaming teeth, and then the idea occurred to both of us at the same time. We inserted them into a file folder in a drawer so it looked like a rat was peering up out of the masses of files. The head was at one end, the tail stuck up at the other. Then, we closed the drawer. After lunch, when Ellen had just come back (thirty minutes late as usual) from her favorite restaurant, Sandra called her on the intercom and requested a file from the drawer. I was holding my breath to keep from collapsing in laughter when – nothing happened. Ellen couldn’t remember the file number long enough to get to the correct drawer! Sandra wrote it down on a slip of paper and Ellen diligently went looking. She opened the drawer and extracted the file and still nothing happened! It took us a bit to figure out that the file, which should have been behind the mink head, had been misfiled by Ellen by chance. And with Ellen’s crazy system of file hunting, she’d found it by chance without ever pulling the drawer all the way open. Well, we were not going to be denied. I slipped over to the file cabinet and opened the drawer and took note of a file that was most assuredly behind the mink head, and went back to my office to call Ellen on the intercom to ask for it. There was a long silence. Finally, I could stand it no longer and went to the door to peek, only to find Ellen rummaging through the wrong drawer! Sandra came along and nonchalantly asked what file she was looking for and pointed out the correct drawer. Ellen had pulled a bundle of files out of the drawer to go through them, including the one with the mink head, and was shuffling them in her arms when the head fell forward onto her chest. Screaming and throwing her hands up to grab at the monster that was leaping toward her throat, Ellen managed to throw about 15 or 20 files so high into the air that all the contents came raining down. Ellen shrieked, stomped, jumped and babbled and finally ran out the door into the hallway, tearing at her dress and hair as though some creature had her and wouldn’t let go! Tim came out of his office to see what the fuss was all about, saw me and Sandra crying and laughing over the little fuzzy mink head and tail on the floor, and realized what we had done. He shook his head in disgust and went out after Ellen to tell her it was only a joke. Sandra and I finally pulled ourselves together enough to begin picking up and reassembling all the files scattered all over the office. Ellen never liked us after that. I don’t know why. (!) She also dug in her heels and refused categorically, no matter how tempting the offer, to apply for a transfer to any other office. The Unit next door was AFDC. Most State offices are staffed with people who have useless liberal arts or psychology degrees and can’t find any other way to use them. Employees of AFDC had to have a four year degree. Food Stamp certifiers needed a two year degree, so naturally they thought they were far superior to us and that none of the Food Stamp certifiers had the brains to assemble and manage an AFDC case. Never mind that very few of them could manage to fulfill the simplest of agency requirements in verification and documentation for the Food Stamp portion, or that we invariably had to do their paperwork over when it was passed to our office. At some point, the State allotted two more positions to the AFDC office, and they were filled by two women who transferred in from another district. It didn’t take us long to realize that they were lesbians, they lived together, and wore matching wedding rings. Well, that’s fine; nobody cared but the loving couple. At first, they shoved lesbianism and gay rights issues in our faces, so we called them the Prickly Pair, Linda and Leila. After awhile, they settled down and realized we didn’t judge their lifestyle. Soon they became as much a part of the office scenery as anyone else. One day the cashier went home early and I was tapped to help count all the Food Stamps for the daily report. There I was, in the bankers cage, counting thousands of “dollars” worth of food stamps when a clerk from the AFDC office – Barbara- came to the window. She had a funny look on her face, so I stopped counting and waited for the news I knew was coming. One of the Prickly Pair, Linda, was pregnant! “What?” I couldn’t quite figure out what she was saying. I guess I was more speechless over the fact that such an intimate item of information was being so openly discussed than I was over the fact that Linda was pregnant, or even the method used to produce the condition. I had to start my count all over again. Everyone was happy for the couple and we planned a baby shower. Linda must have really wanted to get pregnant because she began wearing maternity clothes right away. I’m sure her jeans weren’t even tight yet! A few weeks later, Linda was absent from the office and the word raced around the building that she had had a miscarriage. We were all very upset, almost as if we had lost the baby ourselves. When she came back to work, she was depressed for a long time. Leila ended up abandoning Linda for a nurse she had met at the hospital and Linda married a guy, so I guess she did like guys a little. Not long after all this happened, a new fellow came to work down in the Protective Services unit. He was tall, good looking and such a sharp dresser that all the women were just swooning over him. His name was Alfonso with about half a dozen other names following behind, and he was an exiled Cuban aristocrat. His father had been a diplomat and his mother was a psychiatrist. He was cultured, well-educated, urbane and sophisticated. Our backwater office had never seen anything like him! He naturally had his pick of the single ladies employed by the agency, and I noticed quite a stream of them (even a couple of married ones) “going out to lunch” with Alfonso and returning looking more like they had been wrestling a bear than a burger. As fate would have it, the Southern Belle and the expatriate Cubano fell in love and decided to marry. I had a little difficulty understanding what they might have in common because I knew that she aspired to be a country-western singer and he was fond of opera. But, you just can’t tell about these things. We held a shower for them and the lovebirds made out like bandits with all the goodies. We were invited to their elegant church wedding and the bride looked like an angel. (She managed to maintain that illusion as long as she didn’t speak). Off they went on a honeymoon cruise and we all waited breathlessly for their return, to bask in the glow of their happiness. Those who had aspired to romance with Alfonso could vicariously experience the fruition of such a dream. Well, they returned, but it was more like an icy north wind sweeping through the building. To this day, no one knows what happened, because neither of them ever revealed even a clue to anyone. The upshot of it was that she left him on the wedding night and went home to her parents and received an annulment. Now, what in the world could Alfonso have done to set off that South Carolina wildcat? I suspect he decided that he’d teach her to “speak properly”. Either that or he was a pervert and she wasn’t going to put up with that sort of nonsense! Who knows. It’s one of those mysteries of life that provides hours of enjoyment with endless speculation. They both kept coming to work in the same building, but neither ever spoke to the other again except to conduct business. They also never returned any of the wedding gifts. I was happy in my job and, after awhile, we were all like one big, dysfunctional, but mostly happy, family. Me during my first year working for HRS. The puppy's name was Weegee. Working in a welfare office is very stressful. All day long I interviewed people who were at the end of their rope. Most of them were women who were tired and hungry and had no means of feeding their children. Most were abandoned by their husbands, boyfriends, or families, and most had no employable skills. Many were abused, bruised, sick or disabled, or mentally retarded. The chief feature they had in common was abysmal ignorance. There were exceptions, of course, but so few. My work entailed a great deal more than just filling out forms and signing endless documents, and the State provided an ongoing series of classes in psychology, interviewing techniques, stress management, and assorted others designed to help State workers help the clients so we didn’t burn out completely and become clients too! I started keeping little packages of peanut butter crackers and fruit in my office for children facing a long wait. Some parents figured that if their children cried we’d put their case ahead of someone else just to get them out of there. I fell for this maneuver a lot in the beginning. I was working like crazy to get everyone seen and out of there just so I didn’t have to hear another crying, hungry child. After awhile, Sandra came over and had a little talk with me. “You have to slow down,” she said firmly. “Don’t you realize how they are playing on your sympathy? You’re going to burn out so fast that you’ll be in a hospital if you don’t get a grip!” She recounted stories of other workers who’d just gone off the deep end. I was refusing breaks, eating lunch at my desk, coming early to finish up cases left from the night before, and staying late to see additional, unscheduled clients. I was drinking about two pots of strong coffee a day, and my stomach had a hole in it already. Since I couldn’t turn off my sympathy for the children, I simply out-maneuvered the parents by feeding them crackers and fruit. Not only was I working during the day, I was continuing to develop my skills as a hypnotherapist in the evenings. Sandra was excited and intrigued by this and wanted to encourage me to continue this kind of work. She would never agree to be hypnotized herself, but she decided to become my “publicist” and contacted several professionals in the psychological counseling field, whose offices had begun to spring up in the neighborhood of the State office building. (Not a surprise!) I formed a working relationship with a couple of the more open-minded ones, and was called in on cases where it was deemed desirable to employ hypnosis. As time went by, I also began to get private referrals from these interactions. Sandra also decided that I must teach some of the things I had learned. She organized classes where I taught hypnosis, relaxation techniques, and guided meditation. In a sense, it could be said that I sought to solve problems for others because I could not solve the most basic problem of my own existence. No matter how hard I studied, what I tried, or where I turned, I could not find satisfaction for this “empty” feeling inside that I perceived as a need for God, for meaning and purpose, to be able to establish faith and be content in my faith and my life. I soon decided that I needed a “real” career. The State would help me through nursing school, while allowing me to work part-time. I applied, took the entrance exam, passed and was accepted. Needless to say, it was a crushing schedule, but I knew it would only last for two years, and I could work for the State in a new capacity that would pay a lot better and give me more satisfaction overall. So, while everything about my life seemed to following a positive path, I had a beautiful baby who brought joy to all of us, and I was happy being of service in some significant way, there was unseen pressure being exerted in other areas of life that would, ultimately, lead to total disaster. There are many kinds of death.